If you notice that pumpkin beer appears on shelves a bit earlier each year, it’s because there’s no seasonal creep like everyone’s favorite spiced beer that vaguely coincides with the creepiest of holidays—Halloween. I say everyone’s because studies by the Brewers Association show that pumpkin beers are far and away the most popular of all seasonal styles—ranging from anecdotal Web search engines to statistical scans (sales) across the country. So if you’re going to embrace pumpkin beers, do it right. Nowadays the style runs from the original Buffalo Bill’s Pumpkin Ale made in California to Utah’s Uinta Oak Jacked brewed to a frighteningly clever 10.31%. In Michigan, Jolly Pumpkin Artisan Ales La Parcela No. 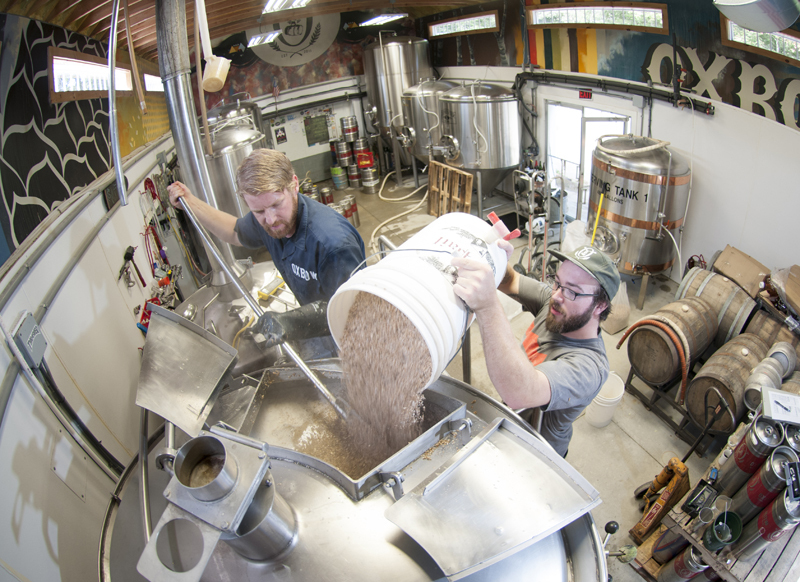 1, an ale with both sour and chocolate notes, jollily brewed with pumpkins, comes courtesy of brewmaster Ron Jeffries. In other words, these beers are not just one thing, one style, so the same ought to apply to pumpkin fests. Take in an autumnal harvest festival or one of the monstrous beer fests dedicated to the ghoulish gourd. Carve out some time to attend these one-season celebrations all across the country. According to the Legend of Sleepy Hollow, the Headless Horseman returns from the grave each Halloween, meaning it’s tough to catch his act if it’s just one night. Thankfully, the Great Jack O’Lantern Blaze in New York’s Hudson Valley gets a 30-night stand beginning Oct. 2 and continuing mainly on weekends through Nov. 15. 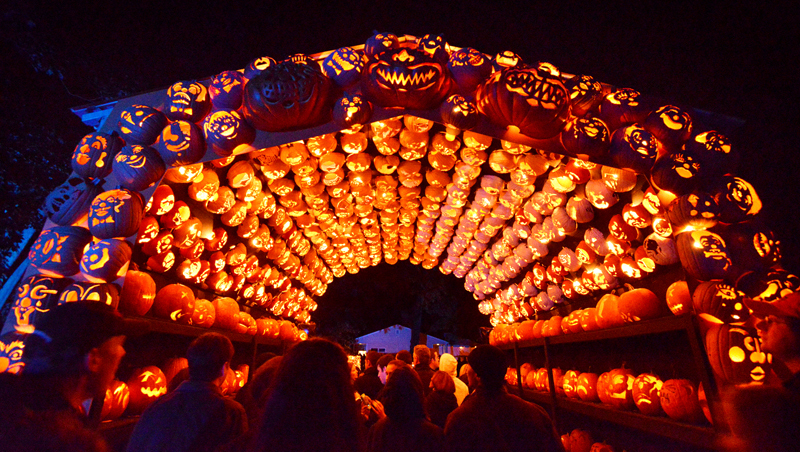 The main draw of the Blaze is the battalion of 6,000-plus hand-carved jack-o’-lanterns. For beer lovers, the area’s real legendary figure is Captain Lawrence Brewing Co. (444 Saw Mill River Road, Elmsford), roughly a 15-minute gallop from Sleepy Hollow. Captain Lawrence’s Pumpkin Ale features pumpkin puree and all that fragrant pie spicing like nutmeg and cinnamon that makes it a classic of the season. Of course, if you’d rather find a warm glow inside yourself, enjoy a couple of pints of Captain’s Reserve Imperial IPA at the tasting room. Its bright piney flavor never goes out of season. Drive 30 miles due south from Columbus on U.S. 23 and you’ll find yourself in the center of Circleville. The town’s population climbs from 13,000 to nearly half a million during the Circleville Pumpkin Show. An institution since 1903, the festivities begin the third Wednesday of October and last four days. The main event is the weigh-in that routinely rounds up gourds weighing nearly a full ton. Don’t miss the parade with the newly crowned Miss Pumpkin or the pie-eating contest. Back up U.S. 23, Columbus Brewing Co. (525 Short St., Columbus) has gained occult following—sorry—a cult following not for its pumpkin ale, although that does fit the bill after such an event, but for Bodhi, a double IPA. It’s such a bold, juicy hop bomb that iterations fruited with tropical or citrus fruits from oranges to roasted pineapples are tricky to find but always a treat. Then again, if all you want in your DIPA is more hops, there’s CBC’s Creeper. Bodhi may have won a bronze medal at the last Great American Beer Festival (GABF) in the American IPA category, but Creeper took gold in the Imperial IPA field. It’s not often you see Peoria suggested as a destination, but the town of Morton just 10 miles away is the Pumpkin Capital of the World (self-proclaimed). The Morton Pumpkin Festival attracts more than 100,000 folks to the city that’s home to the Libby’s brand pumpkin processing plant—the country’s largest. One of the few aspects of the fest that doesn’t include the canned fruit (including treats well beyond pies such as pumpkin pretzels and doughnuts) is the punkin’ chunkin’ contest starring the best in homemade mechanical engineering projects. Back in Peoria, after 16 years the Rhodell Brewery begins its next phase at 100 Walnut St. (the move was not complete at the time this story was filed). The small brewpub, regarded for its experimental beers, has created seasonal offerings including a pumpkin lager and pumpkin saison. Or, head 30 miles east and head straight for the best, if only, brewpub in Normal, Des­tihl Restaurant and Brew Works (318 S. Towanda Ave.). Sour seekers should look for anything in the new Wild Sour series or the venerable St. Dekkera series of oaked wild ales. Visitors may find the kriek or other fruited sour ales, or, fangs crossed, the Pumpkin Flanders may be available. If old-fashioned German-style beer is what you’re seeking, as long as you’re in Central Illinois, this year brings us the 20th annual Peoria Oktoberfest where it’s all about continental festbiers and not pie-flavored beers. For a more serious, dynamic fruit flinging fest, the Pumpkin Chuckin’ Festival returns for the seventh time late September at Stoweflake Mountain Resort. Entrants do not merely chunk, chuck or fling some gourd globs but also erect actual trebuchets—mega catapults—to send the orange orbs flying so far they’re capable of chunkin’ your head right off. Apologies for the segue into Heady Topper, but it’s worth marking your calendar that The Alchemist, purveyors of the East Coast’s most famous IIPA, plans to open its four-and-a-half-acre visitors center in Stowe next year. Seeing as it’s in Vermont, expect maple trees growing outside as well as hop bines that will most likely be purely decorative or may prove too tempting not to brew a special fresh-hop beer exclusively for the tasting room. Given the crowds the brewery receives when Heady’s available, we wouldn’t be surprised if adoring fans started queuing up on All Hallow’s Eve. Also worth mentioning is that although bobbing for apples is a classic contest surrounding the holiday, why plunge your mouth into a bucket full of apple water that everyone else’s face has been in when you can dive into a pint of apple cider at Stowe Cider (1815 Pucker St.)? The dry farmhouse ciders are a hit among apple lovers, and holiday-spiced versions are known to rear their heads. 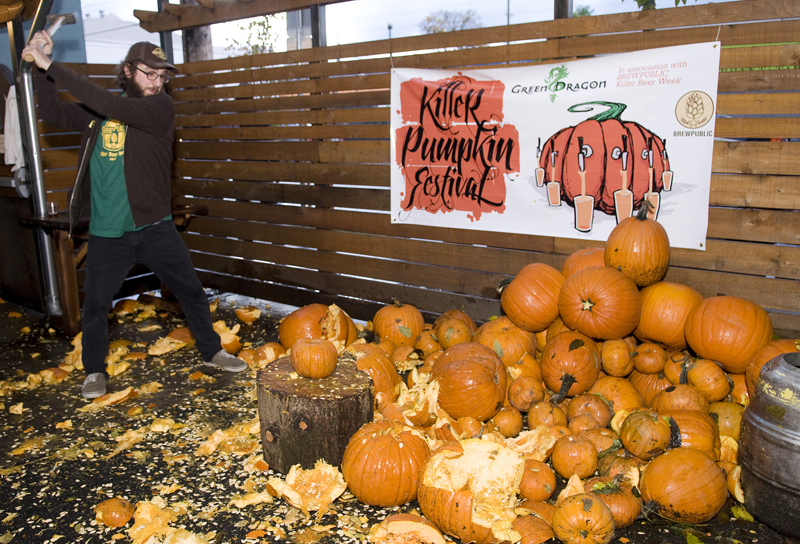 At the Killer Pumpkin Festival, attendees are invited to smash pumpkins. Portland is fertile beer territory, but it’s also surrounded by fecund farmland. At the north end of city limits, at the confluence of the Willamette and Columbia rivers, the farming island that supplies a bevy of berry and stone fruit picking turns into acre after acre of U-pick pumpkins. Equally fun, if less wholesome, is the Killer Pumpkin Festival now going on its fifth anniversary, as part of Brewpublic’s Killer Beer Week. It’s hosted by the Green Dragon (928 SE 9th Ave.). Over 25 taps are overtaken by pumpkin ales—several of which are from Elysian—and in the beer garden, attendees are invited to take out their aggressions or hand-carved mallets and take to some serious smashing of pumpkins. It’s not widely known that the Green Dragon is home to its own Rogue Ales-owned brewery, Buckman Botanical Brewery, which surprisingly focuses on no-or low-hopped beers. A stellar example is the Pumpkin Kolsch, meaning instead of a dessertlike ale, it’s built on a light, dry kölsch base, letting the squash’s true, delicate flavor shine through (yes, enhanced by pie spicing). It’s worth noting that directly across the street from the Green Dragon at Cascade Barrel House (939 S.E. Belmont St.), the world-renowned House of Sour taps Pumpkin Smash, a rum-barrel-aged sour pumpkin ale, which is a far better way to celebrate Halloween than a miniature bag of Sour Patch Kids. A road trip, train ride or a hop on the BoltBus carries visitors up from Portland to Seattle. No story about traveling to pumpkin festivals, as found in a beer magazine, would be complete without shining some candle light on the 11th annual Great Pumpkin Beer Fest the weekend of Oct. 2-3 at Elysian’s Airport Way location (5510 Airport Way S.) in Georgetown. You can enjoy that peach pumpkin ale or any of the other 20 gorgeous gourd-juice beers they’ll be serving among the 80 or so available. Last year’s smash, Punkuccino, makes its return. And let’s not forget, instead of some massive pumpkin that’s full of pulp and seeds designed simply to tip the scales, the massive one at GPBF is full of beer and may simply make you tipsy. As for locally owned breweries, walk five minutes north or south and you’ll find two breweries that are quite different yet present equal parts hyper-local flavor. Georgetown Brewing (5200 Denver Ave. S.) makes Manny’s Pale Ale, a grapefruit pith bomb courtesy of ample Cascade hops. Demand runs so high that the brewers have never found time to bottle it. In the other direction but still in Georgetown, there’s Machine House Brewing (5840 Airport Way S.). The reason you’ll never see bottled beer from these guys is they exclusively serve cask ales. British styles rule, and sessionable, proper, imperial pints of their mild or best bitter provide a relief from the realm of spooky beers. But wait! There’s an even larger pumpkin beer festival, and this year’s will take place on Oct. 3 as a street fair outside the Institute Bar. The seventh installation of the Charlie Brown Pumpkin Beer Festival will reportedly tap more than 120 pumpkin beers ranging from spiced to soured (and ciders). Although the brewers (and cidermakers) hail from all over the world, notable Pennsylvania breweries pouring this year include Conshohocken, Round Guys, Lancaster, Susquehanna and Weyerbacher. Of course, gorging on pumpkin beers that much, no one would fault you for going on a short but healthy walk down to Yards Brewing (901 N. Delaware Ave.) for a pint of classic old reliables like Yards’ IPA or General Washington’s Tavern Porter. Both would go well accompanying most dishes in a traditional Thanksgiving Day feast, but we’re getting ahead on our holidays a bit. Lastly, north of Portland but still south of Canada lie the twin villages of Damariscotta and Newcastle, which annually host the Pumpkinfest and Regatta, Oct. 3-12 this year. When the $10,000 purse for weightiest pumpkin is outshone by the “pumpkinboat” building course, followed two days later by a regatta for said seafaring vessels, you’ve got something. There are both rowboats and motorboats, and both give a new meaning to flotation devices. Furthermore, for landlubbers, there’s a derby for melon hell on wheels. In Newcastle, Oxbow Brewing (274 Jones Woods Road) is a popular regional farmhouse brewery, as in the beer is truly made in a refurbished barn in this rural area. The flagship, Farmhouse Pale Ale, is a light, estery beer that is certainly enjoyable year-round. At any given moment or visit, experimental beers, which are likely barrel-aged and possibly sour, are available at the tasting room. They range from an early smoked chocolate stout to a collaboration with Stillwater wherein a blond ale is aged for over a year in blueberry wine barrels (because this is Maine and blueberry wine is a thing). But given this is the season of fall foliage, try the slightly smoky Oxtoberfest, which has still got the rustic, funky quality that hits the spot after a long day of racing pumpkin boats. Brian Yaeger is the author of Oregon Breweries and Red, White and Brew: An American Beer Odyssey.